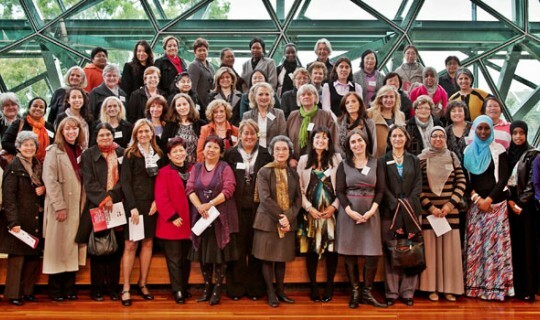 Over 120 women attended the inaugural Cross Cultural Women's Leadership Forum hosted by the Greek Orthodox Community of Melbourne and Victoria (GOCMV) on 16 June 2011 at BMW Edge, Federation Square. The Forum was attended by women from a diverse range of cultural backgrounds representing their specific community. The keynote speaker, the Hon Joan Kirner, AM, presented a talk on keys to success for women in leadership. Ms Kirner said "women need to understand that success for women is about gaining, using and sharing power wisely...to share power equitable women need to work together to change the current male dominated culture to one in which women shape their own lives and that of their communities..."
The Forum consisted of three panels of speakers ranging from women who have recently arrived to Melbourne to women who are active within their established cultural communities. These women shared their experiences in an honest and open way. There was extensive dialogue and opportunity to discuss common practices and lessons learnt. The Forum Convenor, Ms Tammy Iliou said the 'Forum was highly inspirational and thought provoking... ', 'the purpose of the Forum was to bring together women who serve on their respective boards within their communities and to form an ongoing informal network to maintain dialogue and contact....' 'to see it come to fruition was very fulfilling. Furthermore, for this initiative to be driven by the GOCMV highlighted its desire to become a leader not only within the Greek community, but a driver in cross cultural and community affairs'. At the conclusion of the Forum, there was an overwhelming response by those in attendance to be part of an ongoing network. The GOCMV will work with the other organisations and women who participated to proceed this initiative to the next level. In 2010, the GOCMV received funding from the Victorian Government to host the Forum. The Forum was included in the Gift of Light Program organised annually by Federation Square.